I am wondering how to import the \vec font from fouriernc (which is much better designed than that in other fonts families, but I don't like other designs in fouriernc) without affecting the font family (I am using mathpple). 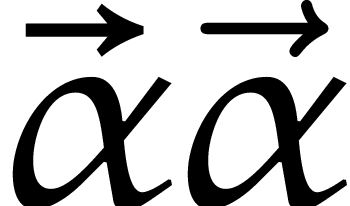 I guess something like Import a symbol from the Fourier font family might work, but I have not idea how to find the index of the symbol (130 in that case of \partialup). Type \meaning\vec, one will get macro:−>\mathaccent"017E\relax. This means the arrow of \vec is defined by symbol of class 0 (Ordinary), family 1, and position 7E (126 in Base 10). Alternatively, one can look up vector in fourier-ml.afm. Not the answer you're looking for? Browse other questions tagged fonts math-mode symbols vector or ask your own question.